In which I strip my book naked! My book is officially in stores today and to celebrate, I thought I'd do a little strip tease. No, not of me, silly! That would be a strip torment, not a tease. Instead, I'm going to reveal everything I love about the physical copy of the book itself, because I can't get over what a great job the team at Arthur A. Levine Books/Scholastic did. Like a lot of people, I love the lightweight convenience of ebooks. But with only a few exceptions, they are a design wasteland. The e-ink is grayish and bland. The covers are shrunken and pixellated, and the interior pages from one book to another look pretty much the same. It's also cumbersome on the Kindle at least to organize a library--something I love doing at home. I'm sure a lot of this will change as technology advances, but with books I treasure, I still want the physical copy. It's the same way that photographs of my family and friends are no replacement for their actual human presence in my house at backyard barbecues. When it comes to actual books you can hold in your hands and tuck away on your shelves, no one does a more beautiful job than Arthur Levine. It's one of the many reasons I am so happy to be one of his authors. A get-out-of-hell-free page. Customize yours! 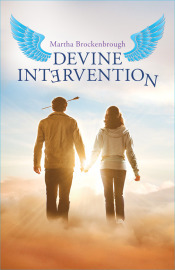 Read the first chapter of Devine Intervention. Today's National Cliche Day. For real! To celebrate, I'm going to turn a silly cliche on its head (to use another cliche), and urge you to please judge a book by its cover. So much work goes into designing a book cover. It has to be appealing, original, and compelling. It has to reflect the tone of the book. It has to stand out on the shelves without being tacky. The list goes on (hello, cliche!). It walks a tricky line perfectly. Yes, this is a book with angels in it. But they are not bare-chested angels with honey-dipped skin. They do not have wings that cause spontaneous orgasms. It's also a book with some romance. But it's not your everyday romance because--for starters--one of my characters is long dead (but not undead. And he doesn't drive a Volvo, because that can't be done any better than it has been.). Which gets me back to my point. Do judge a book by its cover. Please! These miniature works of art are put together to help tell a story. They're meant to be judged. The hope is that you'll love them, too. 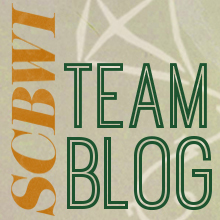 Thanks to Phil, Emily Clement, and Arthur Levine for putting this one together. * Yes, I know that in real life, an arrow through the skull is not funny. Forgive my excitement over this. It's definitely at dorky proportions. 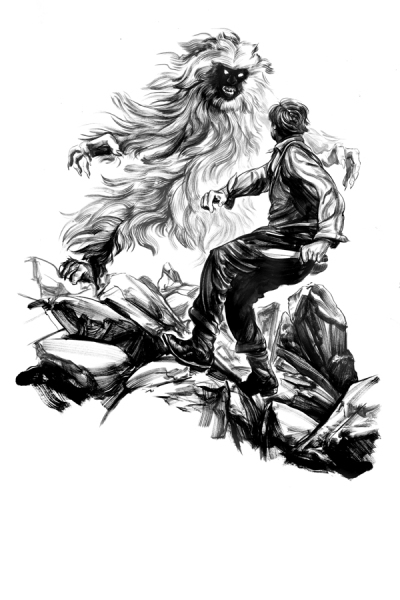 What follows is a discussion of the evolution of the wendigo monster that appears in the first book of THE SECRET JOURNEYS OF JACK LONDON, a new HarperCollins series by Christopher Golden and Tim Lebbon, illustrated by the inimiatable Greg Ruth. Jordan Brown, the delightful editor who oversaw this project, explains how the book's monster became the unholy terror you get to read about in the book. For illustrators, this is a rare insider's look at how an editor thinks, and how a succeesful editor/artist collaboration unfolds. It's also a smart study of how a monster can't just be scary--it also has to support the text in myriad ways. The best way I can put it is also unfortunately the most vague: I want to look at this beast and know that despite how perverted it has been, how much of a beast it has become, it was a human once (and, therefore, something into which Jack could turn). These two wendigos are indeed a might bit different, both in pose and look—the former here below is a bit more trimmed that the previous version, but essentially the same fellow. Both are scaled up a sight bit more than the last take. The second is more like a flying monkey gone mad, with darker fur and more animalian features... see which one you like to pursue forward as I suspect neither does the deed entirely. What I feel like we might want here is a sense of desperation to the beast’s hunger. Right now, his hunger for Jack’s flesh and life has a ferociousness to it, but I’d love to get the sense that this is a beast who hunts not just for a love of carnage, but also as an attempt to assuage a desperate, endless starvation – not simply a hunger, a starvation. I wouldn’t have been able to say this without seeing what Greg had already done, what was working well and what we still needed from the image. 2b I include just to illustrate how full of ideas Greg is. This one wasn’t quite right, but is an insanely awesome drawing in its own right. Made me hope that Chris and Tim might find a way to take Jack to the dark impasse of the African continent at some point. Greg never leaves a stone unturned. I've gone a bit far and wide from our previous more monkey style version as you see....emaciated, desperate and hauntingly post-human monster that he now is. Let me know if we're a sight bit closer to the mark... I suspect this fellow needs more of the hair. This has something necessary that the others didn’t. But I think you’re right, I think we need to add the hair back a bit – is there a way to get the hair and the strength of the last incarnation and combine that with the desperation of this one? I know I’m being a jerk editor now, trying to make physical changes happen by repeating vague nonsense. 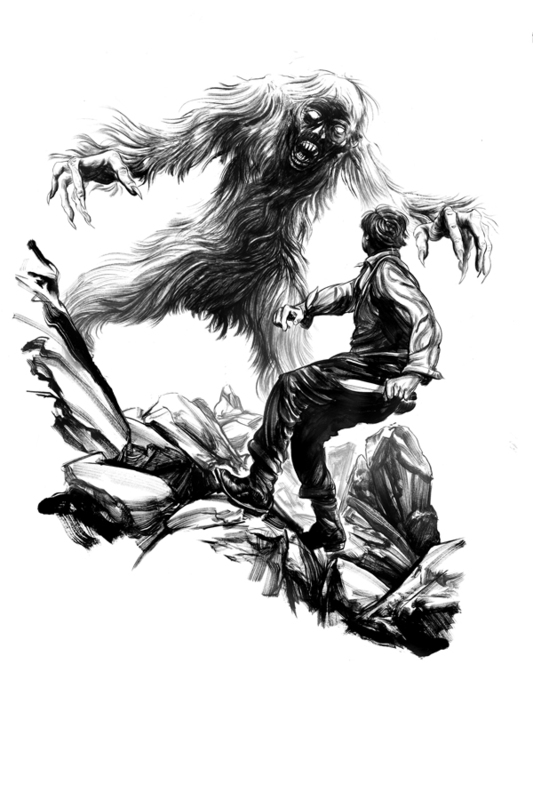 Maybe this will help: I actually love the Wendigo in the camp attack scene (note: there’s a more silhouetted version of the monster depicted from afar in an earlier chapter illustration) pretty much just the way he is, and would be delighted if we could retrofit this to match that. v 4: An awesome thing happened with this revision: I called Greg after emailing him about the last image to talk this over a bit, and we discussed the wendigo for a while, and then got off onto Battlestar Galactica and French silent panchromatic films of the 1920s and whatever else we were talking about that day, and then after like twenty minutes he said “done.” And I said “huh?” And he said “I finished the new sketch. I’ll send it off right now.” He had been sketching the whole time we were chatting, finished a whole new design. See why I love this guy? Anyway, you can see Greg applying a layer of hair on this one, and we’re much closer. My response was long, so I’ll paraphrase: I asked that we have a bit more firm stance, make the beast slightly larger, and let the mouth own the face a bit more. It's a funny thing, scale. 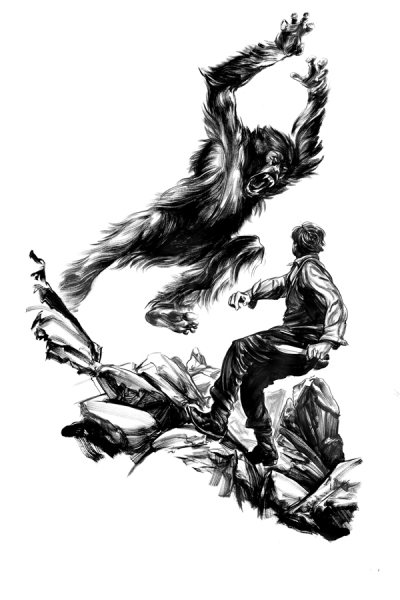 Counter-intuitively, something on the scale of King Kong doesn't have the same level of terror as say, a Mighty Joe Young. There's this horrid middle ground between about seven or eight feet and about ten or so feet that to me is the real sweet spot for the bad feelings when comes to the beasties. Personally I love this weird middle ground—I think there's a lot of great tension in any creature that occupies this arena—but let me know if we're hitting the right spot on this here one. Anyway, the beast is perfect. Which means, of course, I ask him to tweak it one last time, because I’m a jerk like that. I asked for a slightly more powerful stance, and a bit more of the claws. v 6: And here it is, the final, in all its glory. My favorite of the bunch. Flawless. If there’s anything to take from this, it is the sheer inventiveness of Greg Ruth, and his ability to read my mind when I am throwing at him the most vague feedback possible. 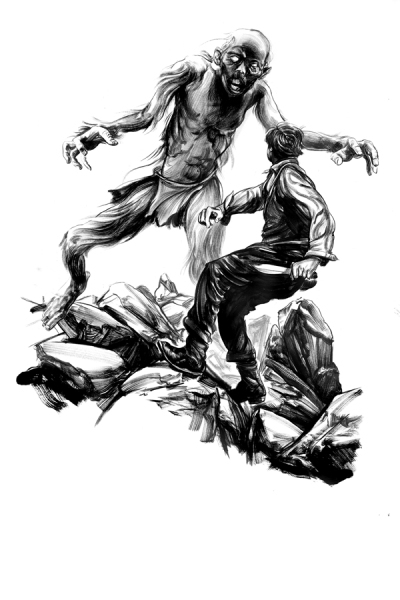 He came up with a monster that is entirely his own, my favorite rendering of the Wendigo that I’ve ever seen, and the perfect rendering for this story. It’s a funny thing, illustrating monsters – they often have to physically embody the themes and narrative of the text in an even more acute and representative manner than illustrations of the heroes. The heroes are meant to represent the reader, and are often made to look somewhat universal for this reason. But it’s the monsters that represent the struggle, in the narrative and often in the hero him/herself, and for this reason, they are often the most difficult to design. But also the most fun, if this is any indication. I've often wondered why books lose their illustrations after you hit a certain reading level. It's not as though art is for kids exclusively--or even mostly. As it turns out, illustrated books were the norm until the 1930s. And now it looks like they're coming back in a big way. In THE SECRET JOURNEYS OF JACK LONDON: THE WILD, illustrations throughout the book by Greg Ruth enrich the story. JB: This project came in as a proposal a long while back, in 2007, and though I don’t think the authors, Christopher Golden and Tim Lebbon, were 100 percent insisting that the book have illustrations, they both have a lot of experience in comics and graphic novels, and are no strangers to using illustrations to enhance text in various ways. 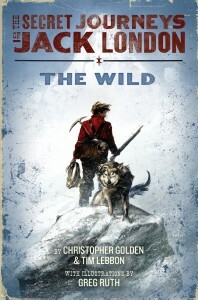 For this project in particular, though, I think we were all in agreement from moment one: we wanted the series not only to recall the style and narrative elements of the great Jack London, but also to go a step further, and have the books themselves pay homage to great turn-of-the-century adventure novels in all possible ways. This, then, became more than simply an editorial endeavor – it was one we took to the design and production of the book as well. 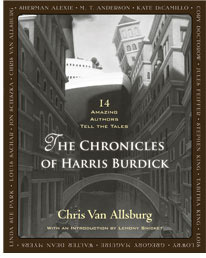 And that, for us, meant that we needed an illustrator to provide images we could set every twenty pages or so, perhaps with a caption, just like you see in the old original pressings of books by the masters of the adventure novel – Jack London, Jules Verne, H. G. Wells, Edgar Rice Burroughs, etc. Luckily, we were able to find the perfect illustrator in Greg Ruth, someone who could do a classic sort of adventure novel illustration style while also making it feel fresh and current. Anyway, illustrations were a part of the plan for this series way back at its inception. I say this because that was back when “kindle” was still a verb to most people, before we could see as clearly as we can now that e-books were going to transform the business. And I bring this up because I think that e-books play a huge part in how this editor thinks about putting together all formats of a book, especially the print book. I adore e-books, not only for their convenience and for the life they’re helping to breathe into our business but also because they’re helping to level the hierarchy of format, and good things always seem to come from that. In the past, for instance, the advent of television led to great leaps forward in the development of theatrical film technology – things that define film as an art form today, like advanced color processes, different widescreen formats, etc, came about in part because theatrical motion pictures no longer had a monopoly on how people experienced moving images with sound, and the industry needed to find new ways to keep people engaged. The same, I think—I hope—will happen with the print book. If I had to wager, I’d say that p-books will never go away, just as any entertainment media format that still has something unique to offer won’t disappear. But the proliferation of e-books will mean we won’t be able to take p-book design and creation for granted anymore. If we want people to buy a print book, we need to give them something that the e-book doesn’t offer, and that’s more than just ink and paper – it’s excellent book design; it’s the choices we make about type faces and margins and front and back matter; it’s the production values of the jacket and the interior paper that speak to the fact that reading a p-book is, amongst other things, a tactile experience; and it’s illustration work that plays with the text in ways that makes specific spread choices and page turns matter. This is not to say that reading a p-book is a more rich or legitimate process than reading an e-book. Quite to the contrary, it emphasizes that they are similar but different experiences, and that we would do well to give those faithful to each format a reason to be excited about that format, by having our production and design choices speak to each of their specific strengths, not just the strengths of the media in general. This is not the only factor in the proliferation of illustrated novels, of course. I think that the movement of comics and graphic novels and other forms of hybrid literature into the mainstream has played an important part as well. 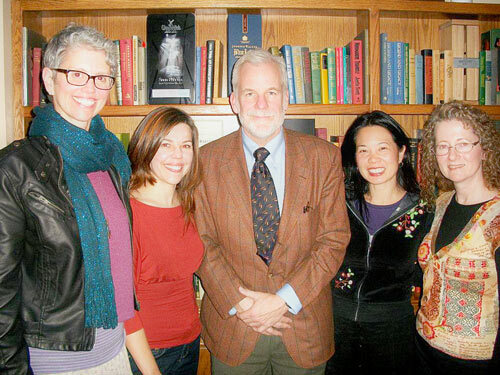 Young readers are less likely to see illustrated literature as something that they need to grow out of, and teachers and librarians are less likely than ever before to marginalize illustrated literature as an art form for readers as they move through elementary and middle school. I think there is also a new appreciation of the concept of “retro” in young people’s literature now, which a lot of these illustrated novels speak to. Perhaps most important is the fact that, for today’s young reader, the concept of format is a fluid one – they’re used to seeing their text and their sounds and their images playing together in interesting ways on computers and phones and handheld game systems, and even though reading is a foundationally different experience than the main purposes for which those devices are created, the base of experience carries over, I think. But that’s what I love about new technologies and formats as they apply to our audience: these readers are learning at a very young age to experience entertainment media with much fewer boundaries and restrictions, and this opens us up to mixing up our publication plans a bit, while still maintaining and strengthening the sense of “bookness” that keeps our preferred media vital. Reading, at its heart, differs from other main entertainment experiences in that it is the only one where the person experiencing it dictates the pace and actively participates in its consumption (I have thoughts on how this applies to audio books, though that would add length to something that is already too long).